The fate of the wooden bridge — the last of its kind on Highway 1 — has consumed the tiny community of Albion, which sits about three hours North of San Francisco on the meandering coastal highway. Caltrans says the bridge is deteriorating and needs to be eventually replaced. 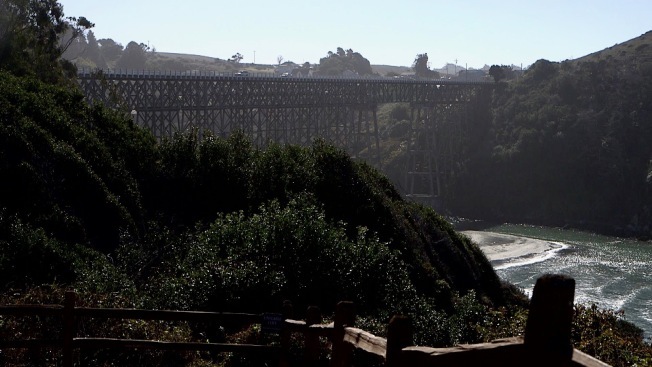 But a group of residents who have formed the group Albion River Stewards believes the bridge is safe — and is an iconic feature keenly anchored to the free-wheeling spirit of the Mendocino Coast. Joe Rosato Jr. reports. Peter Wells’s gaze wandered out the window of his rustic North Coast restaurant, falling on the distant Albion wooden trestle bridge — the very view on which he strategically located his Albion River Inn more than thirty years ago. “It’s ridiculous, it’s sacrilegious to destroy that bridge,” Wells announced in a thick mellifluous voice. The fate of the wooden bridge — the last of its kind on Highway 1 — has consumed the tiny community of Albion, which sits about three hours North of San Francisco on the meandering coastal highway. Caltrans says the bridge is deteriorating and needs to be eventually replaced. But a group of residents who have formed the group Albion River Stewards believes the bridge is safe — and is an iconic feature keenly anchored to the free-wheeling spirit of the Mendocino Coast. Albion River Bridge was built in 1942 during World War II. Because of a wartime shortage of concrete and steel, the bridge was constructed of Douglas fir lumber hauled in from Oregon. While some 20 other wooden bridges along Highway 1 have since been replaced, Albion River Bridge survived — carrying 3,200 cars a day. Yet the wooden timbers that make the bridge unique, are also why Caltrans believes it now needs to be replaced. Engineers from the agency said the bridge’s wooden beams are deteriorating, requiring constant maintenance with a price tag of up to $500,000 a year — according to project manager Frank Demling. Demling said the bridge deck is rotting in places and contractors will soon begin a project to replace more than a thousand bolts on the structure. Among its issues, Demling said the bridge’s treated beams are leaching chromium and arsenic into the soil. Demling said the agency’s engineers believe the bridge is currently safe with perhaps ten to 20 years life left. But they also think the structure is to the point where it’s no longer economically viable to sustain it. Demling said a 2014 report listed the cost of rehabilitating the bridge at $24 million, compared to $66 million to replace it with a new structure that would include dedicated bike and pedestrian lanes. The Albion River Stewards counter Caltrans’ claims, citing a report by its hired engineering firm with expertise in wooden bridges which found the bridge safe. The group said the cost of maintaining the bridge would be far less that the replacement option, and would have a far lesser impact on the coastal community. The tiny hamlet of Albion prides itself as home to free spirited artists and thinkers who traded in concrete cities for a tranquil coastal enclave off the beaten path. In a way, the wooden trestle bridge set against the Pacific Ocean has become the community’s flag — its image even gracing the city’s volunteer fire trucks. A concrete replacement bridge, they said, would upset the area’s fragile character. Last week Caltrans removed a stand of Eucalyptus trees at the bridge’s northern edge to begin conducting geotechnical tests that will help determine the cost of replacing the bridge. Caltrans plans to bore into the ground to determine how deep new anchors would need to be set. Demling said next year the agency will also conduct a test on the roadway to determine what shape it’s in. He said the challenge with rehabilitating the bridge is that the bridge would have to be closed while the work is done, compared to a new structure which would be built alongside. Wells said he’s concerned the upcoming geotechnical work will hurt his business — not to mention the impact that replacing the bridge altogether would cause. The group has appealed to the California’s Coastal Commission to stop the work, but so far the commission has given the green light for Caltrans to continue. Residents believe the tests and construction would also impact wildlife in the area. Caltrans denies there would be an impact. Wells stepped into the yard of his inn, which boasts sweeping views of the ocean and the bridge from the windows of all ten cabins on the site. He said the community effort isn’t just aimed at saving a bridge — but also a way of life.